The name says it all. These are pieces that I use when giving a concert. There are 10 in all. 4 of them are not keyed. The didgeridu piece is in C, but can be played with most any flute as the didge has so many overtones that it's almost atonal in nature. There are 4 in F#m and 1 in Am. I was a drummer for 23 years, so the drum parts will keep a steady pace. No funny business going on there. The melodic accompaniments are not obtrusive and work well for a background for your playing. Total playing time is almost 45 minutes. Here's some feedback from a fellow "flutie" who has purchased this CD. know when you have another one available. I have some of those drum "pitty pat things" and they are boring to play with and I feel that they are boring to listen to also. I found this CD very inspiring the first time I played with it. It's very creative and inspires new creative ideas. keep up the good work! DS"
There's a link below where you can hear short clips of some of the tunes to give you an idea of what's on this CD. (You'll have to get the CD to obtain the complete pieces.) They're all different. No two are alike. 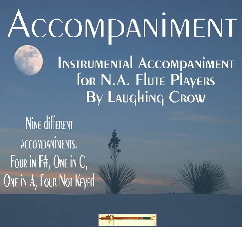 There's plenty of inspiration in this CD to make your playing time more interesting. The playing times are indicated after the title. If an accompaniment is too long, I just reach over for the volume control and fade it out when I'm done playing. As I mentioned, these are the backups that I use in my performances. There is enough variety that I always have at least several for any occasion.